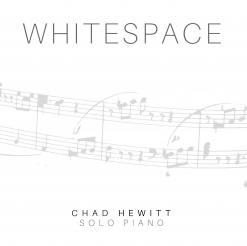 Whitespace is the debut solo piano album by Utah composer/pianist Chad Hewitt. Released in the fall of 2017, it has been nominated as “Album of the Year” by Whisperings Solo Piano Radio. 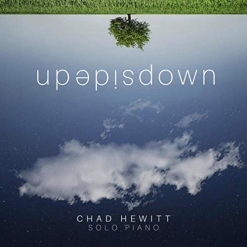 Hewitt’s website carries the motto “quiet music for a noisy world” and that’s actually a very apt description of this album. Don’t be fooled, though - this is not ear candy. While there is an air of calm and optimism running through most of the twelve tracks, this music has enough substance for those who listen to music more closely to hear something new each time. It makes a wonderful backdrop for other activities, but treat your ears and heart to the full beauty and impact of the music from this exciting new artist. Whitespace was recorded and mastered by Joe Bongiorno at Piano Haven Studio. The sound of the piano is excellent, as it always is with Joe at the control panel! Whitespace begins (ironically?) with “Endings,” a thoughtful and reflective piece with a melody that’s strong enough to support lyrics (but doesn’t need them!). Bittersweet yet hopeful, it sets the gentle tone for the album. “Broom Tree” starts in the upper octaves of the piano, light as a feather and very delicate. When it moves into the mid-range of the keyboard, it takes on a more serious demeanor. There are biblical references to the broom tree, which is actually more of a desert shrub. One of my favorites is the gentle but deeply expressive “While You Wait,” which, to me, sounds like soul-searching at the piano. “Created” is a very light, simple waltz that overflows with childlike innocence and honesty. “’39’” is another favorite and reminds me a bit of some of Michele McLaughlin’s music. I think it’s really interesting how the piece flows along at a pretty even pace and then speeds up or slows down a bit and then goes back to the original tempo - kind of the way life does! I also really like the mysterious minor key feeling of this one! “Rooftop” is a little different - almost like a folksong - expressing a feeling that is relaxed and peaceful. “Night Walk” is my favorite piece on the album. It strolls along for a bit and then seems to encounter something in the darkness that might be slightly ominous - or maybe it’s just the darkness itself that’s a little bit unsettling. The easy-going main theme weaves in and out of the darker sections making for a very vivid and fascinating piece! The title track begins with a poignant, haunting melody in the upper range of the piano and slowly builds intensity as it moves into the mid-range of the keyboard. I like this one almost as much as “Night Walk”! “Sabbath” brings the album to a very peaceful close with a beautiful and very sincere expression of faith. Wow! Chad Hewitt is off to a fantastic start with Whitespace! It is available from Amazon, iTunes and CD Baby. Highly recommended!